We’re approaching wedding season, and reader Susan G. requested an article about hosting a bridal shower. The maid/matron of honor, bridesmaids, family members and/or close friends often throw a bridal shower for the bride before the wedding. It is best to check with the bride first to make certain she wants a bridal shower and get her guidance on the level of formality. Like most parties, a checklist is a good idea. Here is one for bridal showers. Pick a date and time with the bride. Showers are usually held anytime between two weeks and six months before the wedding. Set the number you are comfortable inviting. Put together the guest list with the help of the bride – close female family members on both the bride’s and the groom’s side are included as well as the bride’s close friends. Some brides may want a theme for the party. Ask the bride to create a registry. Compose and send out the invitation. At the shower, there is food and drink and usually the bride-to-be opens the shower presents. You can serve lunch, tea, cocktails or any other meal. Unless you are hosting a full seated meal, choose fun ‘finger food’ so that guests can move around and balance plates on their knees. You can be creative with both savory bites and sweets. There can also be games. A game tends to keep the group together and celebrating the bride. Games usually focus on how well the bride and groom know each other, or how well suited they are. The games are often very funny as well as informative about the couple. My personal philosophy is to keep games simple. I don’t want to be divided into teams for a game – this isn’t field hockey. My favorite games involve questions that are asked of the groom about the bride and then asked of the bride about herself to see how well the groom knows his future wife. The hostess has the groom answer the questions well ahead of time. I made cards for each guest with a photo of the couple on one side, and one of the questions on the other. Each guest asked her question of the bride and her answer was compared to the answer the groom gave. For example, in a bridal shower for my niece, one question to the groom was ‘What is Jacqueline’s favorite snack to carry in her pocket book?’. The groom answered ‘Swedish Fish’ and when asked the same question, the bride answered ‘Swedish Fish’. In that couples’ case, they had the exact same answers for 19 out of 20 questions. It was impressive! 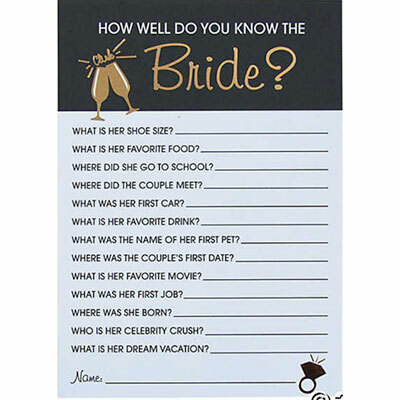 If you aren’t a DIYer, you can purchase premade “What Would the Bride Say” kits. Oriental Trading has these questions that are $6.19 for 12 sheets. 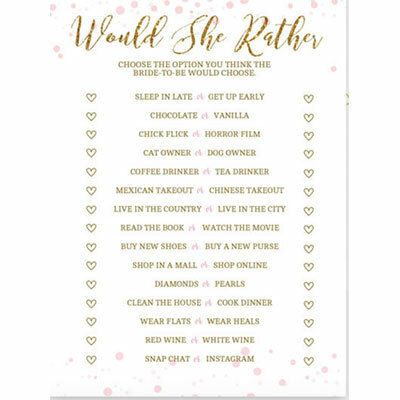 This similar game narrows the choices and is called Would She Rather. There are fifteen questions and for $4.00 you can download the PDF and print out as many game cards as you’d like. It’s great to personalize the bridal shower. The website Zazzle is a great source for personalized party products. 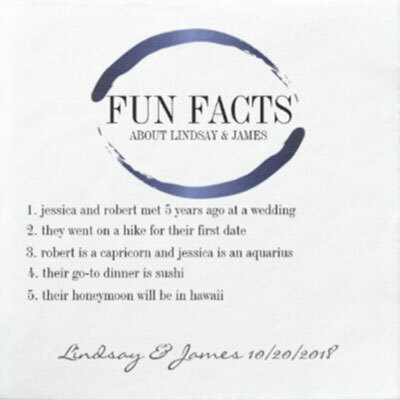 These Fun Facts paper cocktail napkins are conversation starters and answer many questions guests might be asking the bride-to-be. The napkins are 3 ply, 4.75” square, and a set of 50 is $43.95. For Your Party is another good website for personalized party goods. No one wants more junk, but it’s nice to have a good party favor for guests to take home. 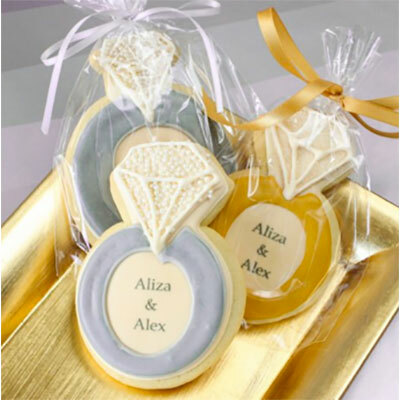 My personal favorites have been a delicious personalized individually wrapped sugar cookie. I am providing a link to an online source but I would try your local bakery first. These are $4.31-$6.49 each based on size. 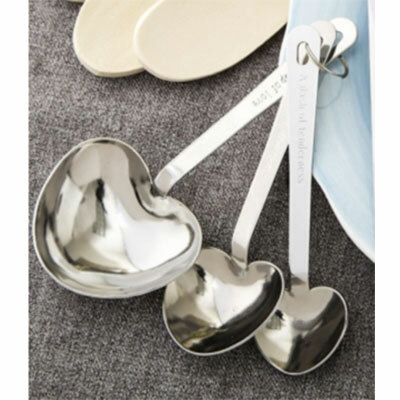 These heart-shaped measuring spoons are sweet and usable. They are individually wrapped and each spoon has an engraved love saying. The sets are individually packaged. 2-19 sets are $2.34 each and 20-41 sets are $1.59 each and 42-99 are $1.43 each. I’m still using a set I received as a guest. The website has many other party favor ideas in addition to the measuring spoons. Finally, a lovely idea is for the bride to be to make a small donation in each guest’s name to her favorite charity. The hostess makes up a card for each guest with their name, the name of the charity and a note from the bride to be. Don’t forget to ask a helpful guest to take some photos during the shower for the bride to have. What Are They Going To Need For The New Baby? No, family members from either family may give a bridal shower and often do. Love this article! Fantastic ideas and very helpful. Thank you!